You must have heard a whistle on the latest diesel cars. This sound, is quite tempting because the sound is very showing that the car is equipped with the latest technology. 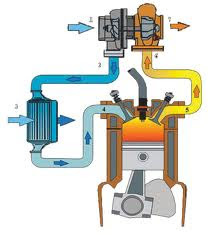 The sound causes by turbo intercooler devices that are embedded in almost all diesel engines. Then, what is the use of turbocharger? what is the effect on the engine? and how does it work? Turbocharger is a device used to maximize air supply into the engine during the intake stroke. It aims to get bigger engine power. Turbocharger, already used on diesel engines for a long time. However, for now days turbo has produced with more upgrade. You must have encountered the label "VGT", "VNT", or "VCDI". All of it refers to the technology used on turbochargers. What is the use of Turbocharger ? We know that the power of the engine, depending to mass of air that flowing in to the combustion chamber. If the mass of air coming into the engine have much container, then the power will be high. However, to flow more air much need high engine capacity. This is the turbocharger role, this device will compress the air into the cylinder room even with a small engine capacity. The result, it will be more air that filling inside the cylinder room without increasing the engine capacity. Thus, the power will also rise. B. 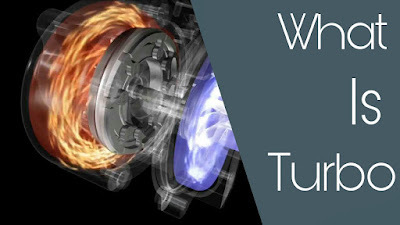 How Does Turbocharger Work ? Turbo charger is like a turbo jet, there are two turbines located in one axis. The first turbine we called as a drive turbine because of its function as a drive section, while the second turbine we called a driven turbine because this will be driven by the first turbine. The work principicle is like a compressor, when the turbine is spinning it will accelerate the airflow in either direction. In this case, the driven turbine is located mid of the intake air flow. Thus, when the turbine driven drives, the air inside the intake will flow faster toward the combustion chamber. The question is, why is the turbine driven spinning? where is the power source ? Apparently, the power source for spinning the driven turbine comes from the engine itself. Precisely on the exhaust gas, this waste gas still has residual energy in the form of gusts that are not small. If we put the turbine in the middle of the flow of exhaust gas, then the turbine will rotate with the speed according to the exhaust gases. In this case, the turbine drive is placed inside the exhaust manifold and between the drive turbine and the driven turbine are also made in one axis. Thus, when the drive turbine spins, the turbine driven will also rotate to pump more air into the engine. The higher engine RPM, the higher exhaust gas gusts. This makes the turbine spin faster, so it can be said the higher engine RPM, the greater air flow into the combustion chamber. This is because the air molecules will be bigger if the temperature is high. In this case, the turbo device will be associated with high-temperature exhaust gases. Thus, if the air intake through the turbo surely the temperature increased. The intercooler function is to lower the intake air temperature so that the molecule can be smaller, it make more molecules of air can enter the engine. This will make the engine power much higher. Supercharger has a shape similar to the turbo, but the supercharger uses a engine pulley as a source of drive turbine (its not using exhaust gases, but using V belt). The advantage, the air temperature will be lower. This turbocharger as described above, using a blast of engine exhaust gases. Although the temperature is higher, this type has a higher air flow. Electric turbo type is the flexible one, because it can be placed anywhere and not inhibit engine power. Thus, the engine power can be higher. If you still have any question about turbocharger, you can write it by leaving comments below.